I planted garlic for the first time last fall and it took me a while this spring to figure out where I had interspersed it among other bulbs and perennials. Then this! ….this fabulous showing of curling greenery in the garden! And although I am moving next week and will never see the harvest, at least I have this journal page – and the promise of next year in another garden. This entry was posted in Garden, Journal, Watercolor and tagged #worldwatercolormonth, garden, garlic, sketchbook, summer by Jean Mackay / Drawn In. Bookmark the permalink. Love the layers of green. (I was just considering tackling some negative painting to capture some dense vegetation myself!) And your elegant lettering works so beautifully with the curve of the garlic. This was tricky to do this way (I realized after I committed to it)– the lettering sort of saves it. Hi Paula- Yes, I just learned that too! I tried cooking with them the other night and it worked well. Now that I’m finished painting, I can cut the rest of the scapes. Thanks for your note! You could have some green garlic soup. Very good. Thanks Nancy– But I’ve just packed away most of our pots and pan– moving at the end of the week! This is such an eye-pleasing way to capture a tangle of garden greenery–lots of color variation and background interest without getting all nitpicky with an overwhelming amount of detail, which is the road I tend to go down if I’m not careful. Oh…you could go down that road with this method too. And I nearly did, but decided I needed to turn the page! Your use of soft greens in this painting makes the painting so refreshing and the swirling garlic greens a fun composition. Thanks for the inspiration. This is mostly cobalt blue with Hansa yellow medium. It is interesting to see how much variation is possible with two colors. Thanks, Jean for the tip; it’s amazing the amount of colors that can be created with only two colors. I think you can pull the garlic itself now too. We get garlic in our farm share along with scales this time of year. It just isn’t dried so different texture/flavor. Thanks Erin- I think I’ll let it grow more and leave it for the new homeowner to enjoy. I’ll be living in limbo for a few weeks and won’t be able to store or enjoy it properly. I so enjoy your posts! Hate to be redundant but that background is fabulous. I especially love the hints of pinkish here and there. I am guessing that you created the wash and then lifted out the negative stems with a damp brush? Or did you scrape them out? I live in DRY Santa Fe, so anything I do with a wet wash has to be a speedy procedure. Kudos to you, by the way for taking time for sketching during a move! Thanks Jessica! I started with a wet wash and then painted the foreground scapes and picked out stems in the background with additional wet washes. Lots of layers here to get the end result. I hope the new owners will treat your garden with the respect it must deserve. Such a pretty watercolor, and to me, it seems it would be challenging to do that complex background without having it overwhelm the rest of the composition. Gorgeous all around – esp. the colors and calligraphy! Thanks Cathy- I picked a few and tried them when cooking shrimp. They were good, but I may have waited too long to saute them, they’re not very tender anymore. Thanks for the suggestion! Beautiful melting of your greens Jean. 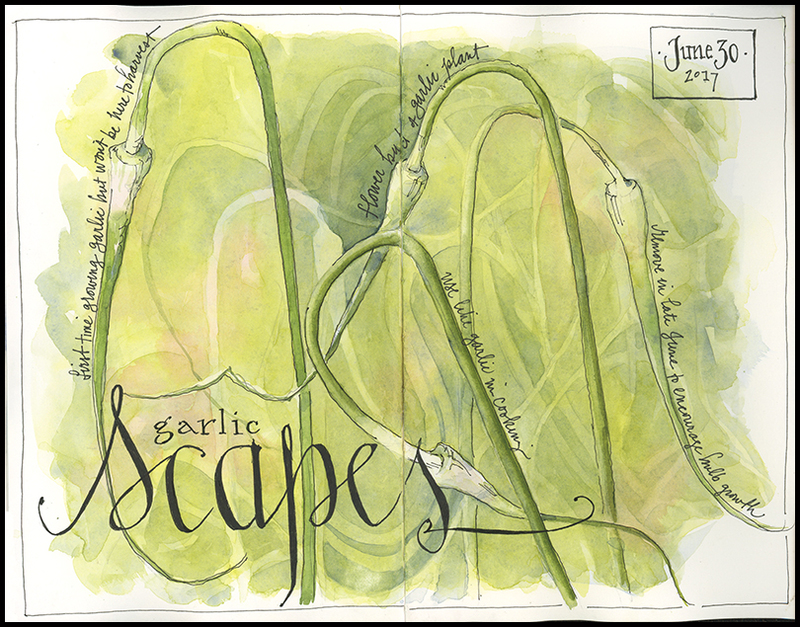 Loving the flow of the scapes. Your lettering is such a beautiful part of your art- I love it! Thanks Lindy- I always enjoy adding it to my journal pages. They don’t feel complete without it. I love garlic scapes. I haven’t had any this year. Good luck with your move.